Well...technically, we're not anywhere near a bay, but we're not TOO far away from the Mediterranean as we vacation in Lyon, France this week - at least we're closer than when we're in Paris - LOL! 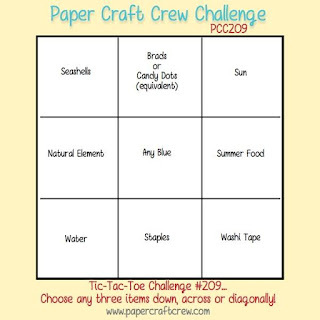 Our theme over at the Paper Crafts Crew Blog this week is a tic-tac-toe board and I chose: water, staples and....seashells. And, yes. I know those don't form a straight line...but I designed this card last week while I was preparing to go on vacation (I'm in Lyon, France) and my brain was not cooperating. Also...technically, they're not seashells, they're starfish, but I'm going with it. Indulge me. Last week, one of my friends and former downline welcomed a little baby boy to the world and he is SO cute! I knew I wanted to make a card and this week's challenge seemed perfect...you know...until I couldn't make it work the way I wanted it to. 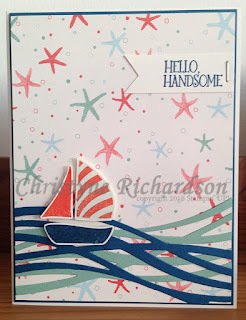 I started off with a base of Very Vanilla and added layers of Dapper Denim and By The Shore DSP. 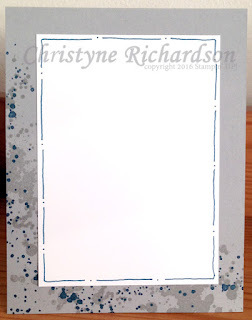 I cut waves using the Swirly Scribbles dies from Dapper Denim and Mint Macaron and added them to the front of the card - thank goodness for the Fine Tip Glue Pen! Then I stamped and cut out the three pieces for the little sail boat - SO CUTE!! 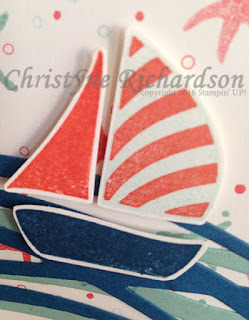 This little sail boat just makes me smile every time I stamp/cut it out. You can stamp it in just about any colour and it will always be ADORABLE! And the finishing touch was the sentiment "Hello Handsome" from the Happy Happenings Stamp Set, stamped in Dapper Denim. And there's that staple - LOL! 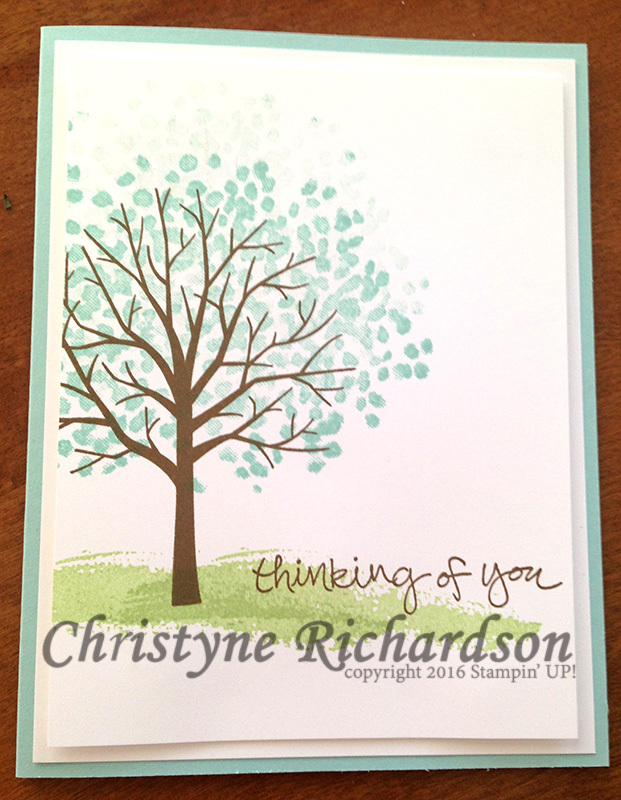 This card is on its way to my friend Kristen and her husband who just had an adorable baby boy! You're going to LOVE this little set!! And if you're coming to Boxes, Bags and Tags on November 12th, guess what?? It's part of your $45 class fee! Happy Monday! Today you get to see the last of my Craft Project Central Cards. If you're new to my blog and would like to see the rest of them, you can do that HERE, HERE and HERE. I'm in Lyon, France celebrating my 25th wedding anniversary this week, but I've got all my posts scheduled, so you won't miss out on anything. 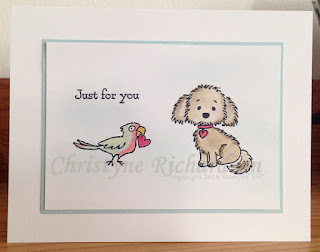 In fact, while today is the last day of my special offer of a free card for every $50 you spend on my Stampin' UP! site, keep reading to the end to see what else I've got going on! I know I said the "Amazing" card from August 22nd was my favourite, but I think I've changed my mind - LOL! I love all the "white" space on this one! The elements all gathered in the middle just look so pretty! The card base is Smoky Slate and I stamped directly onto it using Smoky Slate and Dapper Denim Ink. 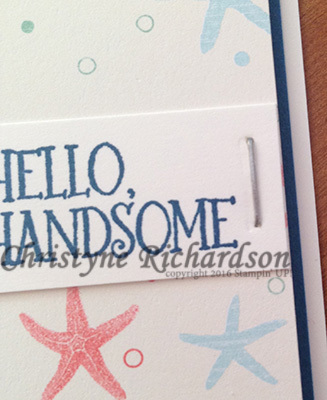 I cut out and punched the tag using the Scalloped Tag Topper Punch - this punch is great because it does all the work for you. Just trim your paper to 2" wide and any length you'd like! Sometimes I like to round the bottom corners, but I left them plain for this one. I tucked a piece of doily behind the tag and stamped the images on it with Versarmark Ink before embossing with Gold Embossing Powder. The sentiment was stamped onto a piece of Crushed Curry using Archival Black Ink. 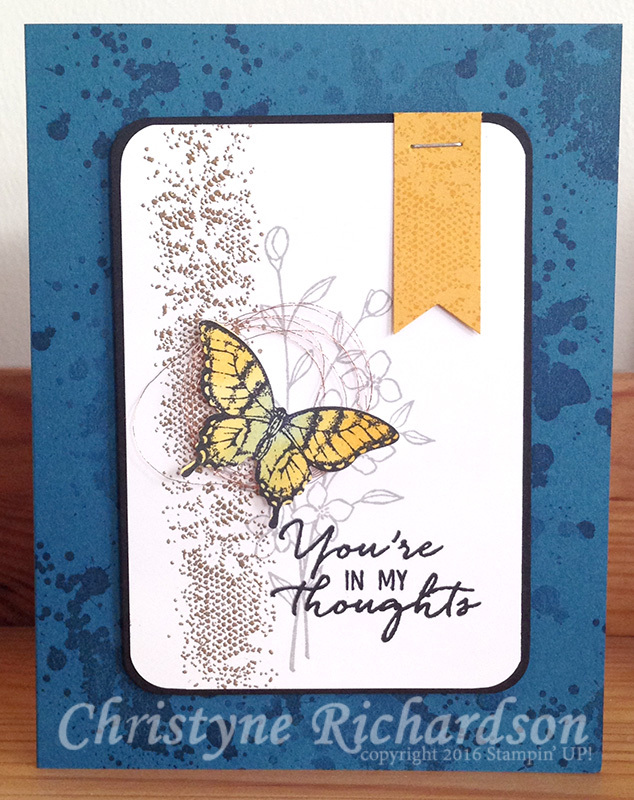 The butterfly, also stamped in Archival Black Ink was sponged with Crushed Curry and Pool Party Ink. His wings were bent up a bit and I attached him to the tag using Stampin' Dimensionals. I tied on some Linen Thread and the whole tag was then attached to the front of the card using Stampin' Dimensionals. 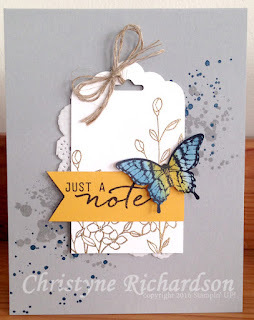 On the inside, I stamped the card base using the same Smokey Slate and Dapper Denim as I did on the front and added a piece of Whisper White Cardstock onto which I doodled some lines using my Dapper Denim Marker. If you've read this far, I have a SUPER SPECIAL OFFER for you! 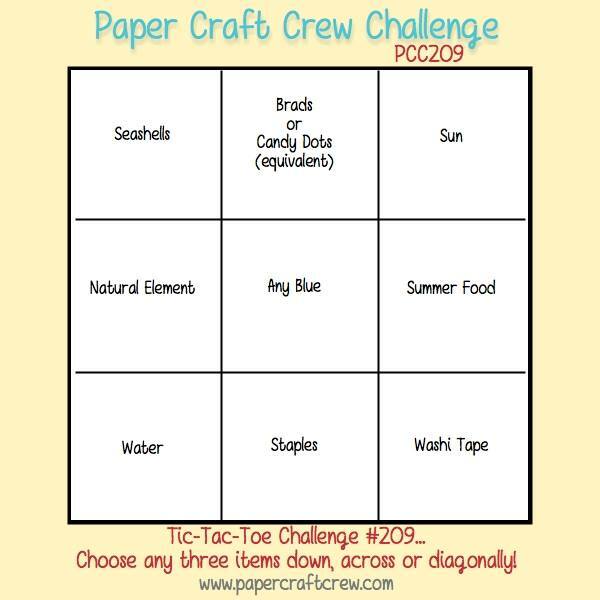 I'm not home to take your orders, but if you place an online order on or before August 31st, 2016 at 11:55 p.m. EDT on MY Stampin' UP! site, AND use hostess code: C4SYKEKG before checking out, AND your order is OVER $100 before tax and shipping, I will REFUND your shipping costs via e-transfer upon my return from holiday. AND, your name will be entered into a draw to win the Craft Project Central set I've been showing you for the past couple of weeks. We weren't exactly what you'd call friends in high school. I mean we knew each other, but that was about it. She hung with the cool crowd and I...well, I didn't. Truth be told, I don't remember a whole lot about the two years I spent at St. Thomas, except for maybe a few crushes, the school play I was in (A Christmas Carol - I had a bit part) and the rugby/football teams. The most important things I remember of course...like how Mr. Bates told me that "they" (the cool crowd) were jealous and wanted to be like me and that's why they acted like they didn't like me. I don't know if it was true or not, but I believed him and it got me through Grade 11. And of course I remember prom - Gerry and Bobby doing Electric Avenue, dancing with my husband (I know, right???) and the father/daughter dance. But now, she's fighting cancer. She's going to win. She's just that stubborn. She loves to garden and often posts pictures of the most BEAUTIFUL flowers on Facebook. A lot of her friends post pictures of beautiful flowers on her page to cheer her up. I like to garden too, but I'm not nearly as awesome as she is, so I did something else instead. Stamping I can do...and I'm pretty good at it if I do say so myself. So I stamped. And I sent a card. I'll send some more too...as long as Canada Post cooperates. Hopefully Joanne will find some comfort in knowing that friends new, old and reacquainted are all pulling for her. 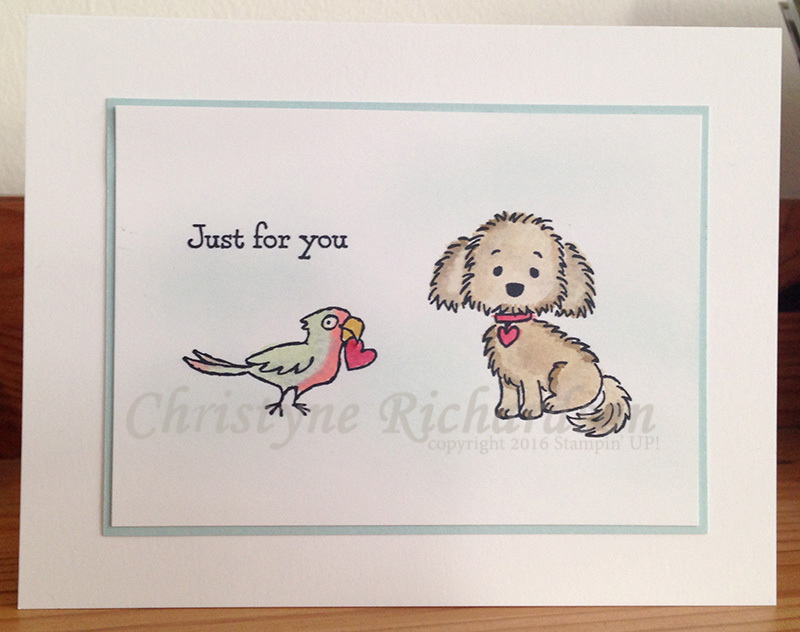 Can you stand any more cute puppies and birds? I sure hope so! For this card, I added all the images to one big block and stamped them all at the same time - EASY! This time, I coloured Bella in Crumb Cake and added a Real Red collar and heart. I've done Bella in a few colours now, and I'm pretty sure my favourite colour is Soft Suede. I added some sponging in Soft Sky as the "background" and that's it! I love, love, LOVE this card! Maybe it's even my new favourite! 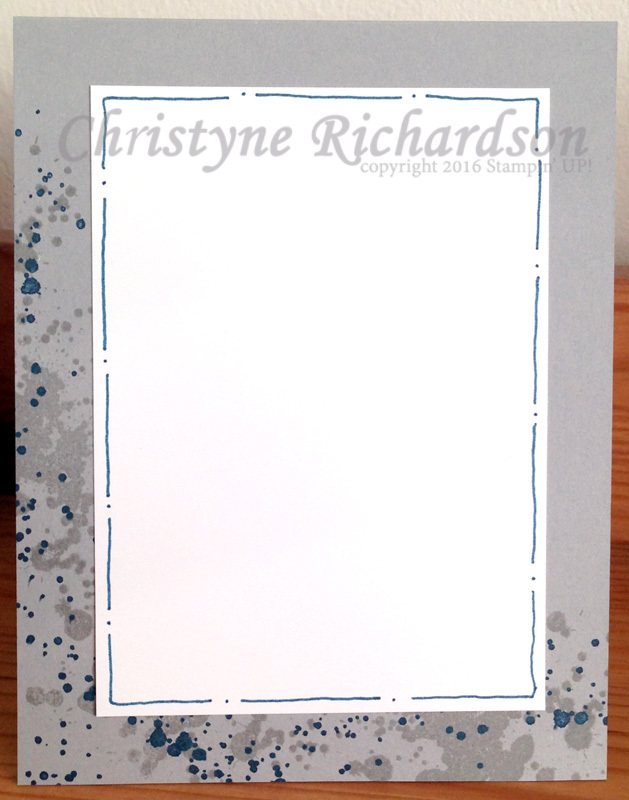 :) The base is Dapper Denim and it was stamped using Dapper Denim Ink both at full strength and stamped off. The image panel is Whisper White layered on Basic Black. The Whisper White piece was stamped with Smoky Slate and then Versamark Ink which was embossed using Gold Embossing Powder. 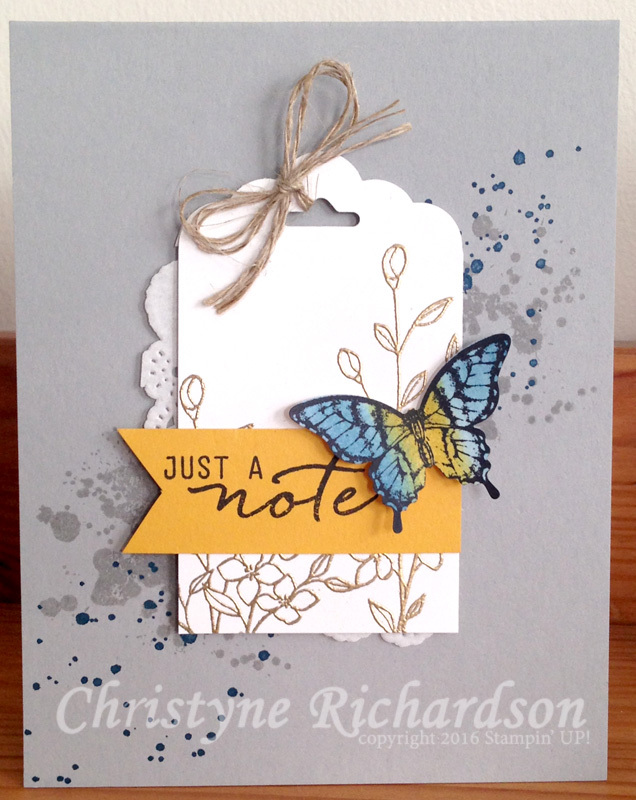 Both the sentiment and butterfly were stamped in Archival Black Ink and the butterfly was sponged using Soft Sky and Crushed Curry Ink. It was adhered to the front using Stampin' Dimensionals after swirling some Gold Metallic Thread behind it. 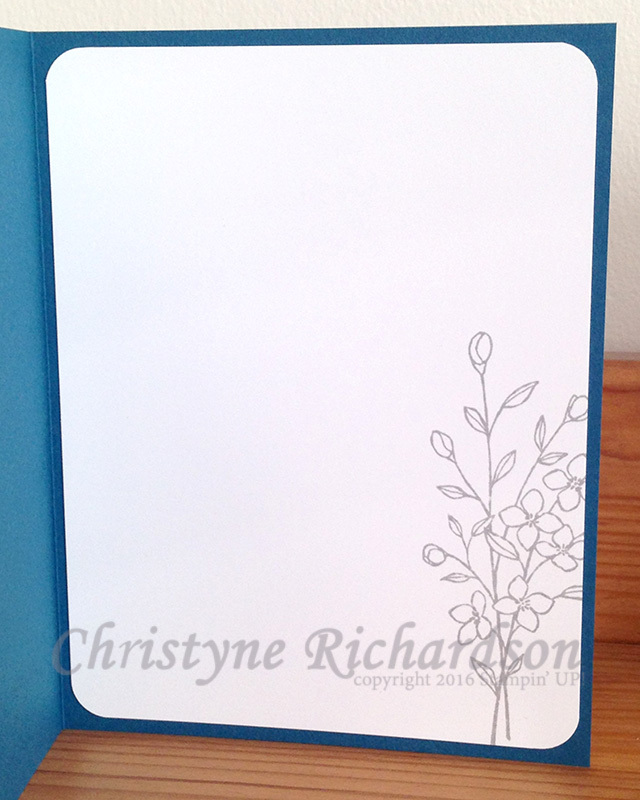 The inside was simply stamped with Smoky Slate Ink. These came about because I misheard the directions in a video for something you'll see next week. I was merrily creating along and when I had made them all, I realized that they were too big for the project I was *actually* working on. Now you'll have to wait for next week to see it - LOL! 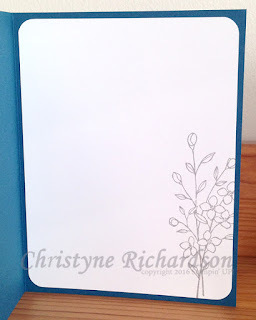 I started off with a 5 ½ x 5 ½" piece of Blooms & Bliss Designer Series Paper (I'm almost out of the blue/green papers - good thing I have another pack on standby!) 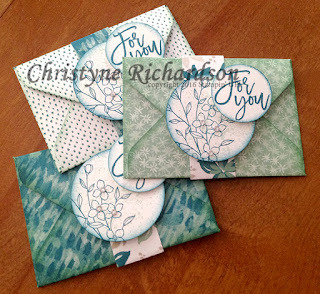 and created a gift card size envie using my Envelope Punch Board. Then I went a little NUTS with the sponging...it's pretty much EVERYWHERE! I added some Basic Rhinestones, because you can never have too much bling!